Am I to understand that the world now knows to expect off-speed stuff from Bronson Arroyo? With that secret out, we’ll never survive! The rubber game happens this afternoon at 1:45 p.m. Homer Bailey (RHP, 1-0, 0.00 ERA) takes on Jake Westbrook (RHP, 0-1, 0.00 ERA). Get me an autograph while you’re there, would ya? 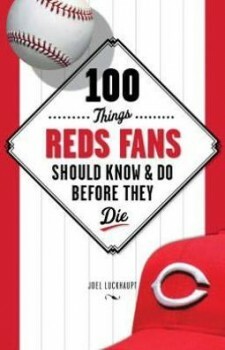 Tonight at 7 p.m. Joel Luckhaupt, author of 100 Things Reds Fans Should Know and Do Before They Die, will be appearing at the Joseph Beth Booksellers in Cincinnati (Rookwood Pavilion, 2692 Madison Rd, Cincinnati, OH). In this ultimate resource guide for true fans of baseball’s first professional team, author Joel Luckhaupt has collected every essential piece of Cincinnati Reds trivia, as well as must-do activities, and ranked them from one to 100, providing an entertaining and easy-to-follow checklist for fans to complete in their lifetime. Most Reds fans have taken in a game or two at the Great American Ball Park, have seen highlights of the Big Red Machine, and remember the team’s surprising triumph in the 1990 World Series. But only real fans know which 15-year-old took the mound for the Reds in 1944, can name the pitcher who gave up Pete Rose’s 4,192nd hit, or remember how many dogs owner Marge Schott owned. 100 Things Reds Fans Should Know & Do Before They Die is the perfect book for any fan of Reds baseball, whether a die-hard booster from the days of Ted Kluszewski or a new supporter of Joey Votto, Johnny Cueto, and Aroldis Chapman. Luckhaupt is amassing quite a portfolio of Reds’ related literature. Make sure to pick up the whole set and get them signed now, before he goes the way of Pete Rose and it costs you 50 bucks for his John Hancock. The Reds haven’t won a series in St. Louis since September 2011. In fact, they’ve won only 3 series in St. Louis in the last 10 years.